It’s no secret that much of Calvert County culture revolves around the water that surrounds it and the people who work it, so when I moved here, I didn’t just want to learn about waterman, I wanted the experience of dredging for oysters and pulling crab pots. The problem was that you can’t just hitch a ride on a commercial fishing boat and join in. Then we met Captain Rachel of Solomons Island Heritage Tours at Calvert Marine Museum’s Maritime Festival and booked exactly the outing I’d hoped for. A high school teacher and local waterman, Rachel customizes educational tours aboard her commercial fishing boat, The Roughwater, but if by educational, you think boring, think again. 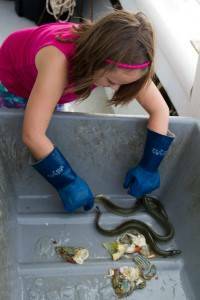 There’s no time for boredom when you’re hauling up bait pots and sorting live fish or trying to catch eels that you’ve caught. We did all of that, and more. 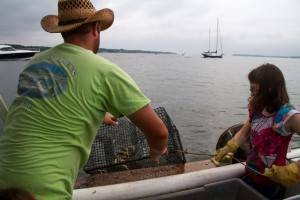 In two hours, we pulled bait pots, eel pots, and crab pots, dredged for oysters, netted crabs from pilings, and learned about blue crabs. My girls were hands-on the entire time. They worked together to pull the oyster dredge and took turns pulling pots. 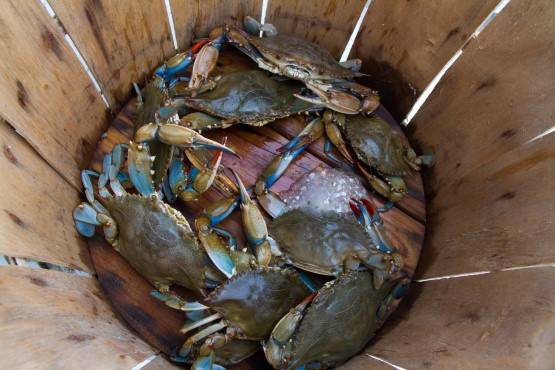 They all sorted through the sea life and filled a bushel basket with crabs, learning the difference between males and females, soft and hard. 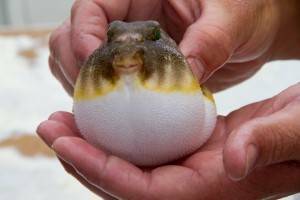 We also learned about skillet fish, toad fish, and how to puff up a puffer, one of the girl’s favorite things. Since Solomons Island Heritage Tours has several special permits and licenses, they can run these educational tours and do things that other boat tours and waterman can’t do. For example, though it wasn’t oyster season yet, we were able to dredge and see the oysters it pulled up before putting them back on the oyster bar. This gives them a lot of flexibility in the tours they offer. During our last hour Rachel and her brother set up the crab pot, showed us how to fill it (we’re new to this), and steamed our crabs right there on the edge of the water. Then we had a picnic, learning to pick, and filling up on blue crabs we’d just pulled from the water. This is absolutely one of the best family experiences that we’ve had here in Calvert County and something that I’ll do again. Everything is hands on. You can do as much or as little as you want. My girls loved it and we all did something that we’d never done before, and learned a lot more about local waterman, an important part of Calvert County culture. Thanks for sharing Tiffany Therese Weber Stahlbaum!